You probably know that the Super Bowl is next Sunday, February 2nd. (Actually, did you hear that they “reserve the right” to hold it any day between Friday and Monday, depending on the weather?! Crazy! But that’s beside the point.) Super Bowl “Sunday” offers something for everyone. Tell me which you like in the poll at the bottom of the post! If you like sports, it’s pretty much the biggest game of the year. If you like music, the half time show is one of the best performances of the year. If you like parties, I’m guessing this day ranks close to the top. If you like food, goodness knows there’s a lot of it on Super Bowl Sunday. If you don’t like any of those … I don’t know what to tell you. Now, back to the food. Would you believe that Americans spend $50 million stocking up on snack food for Super Bowl Sunday … and we’ll consume 325 million gallons of beer, 1.23 billion (with a b!) chicken wings, and 11 million pounds of chips? I’m all about splurging on occasion, but if you’re looking for some delicious and satisfying snacks that won’t break the calorie bank, then I’m here to help. I highly recommend my Creamy Kale Artichoke Dip, or my Veggie-Loaded Guacamole, but if you’re also looking for something that’s not a dip, then these fries are for you. 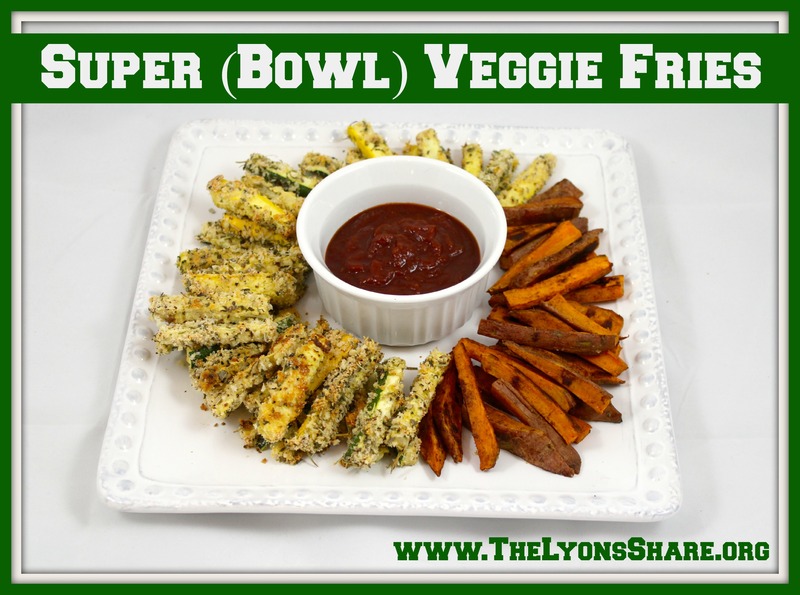 My initial plan for these Super (Bowl) Veggie Fries was so creative … the Broncos are orange (and blue) and Seattle is green and yellow, so I had all my bases covered. Unfortunately, I was thinking of the former Seattle Super Sonics, not the Seattle Seahawks (I’m a basketball girl at heart! ), and lime green and navy just didn’t fit into my plan. The colors may not have worked out, but the fries are still delicious, so I hope you give them a try anyway. They’re fun and easy to make, and a great way to get in your veggies on a snack-filled day. They’re best right out of the oven because they have a perfect balance of softness and crunch (when I microwaved them the next day, they were still tasty, but a bit too mushy). 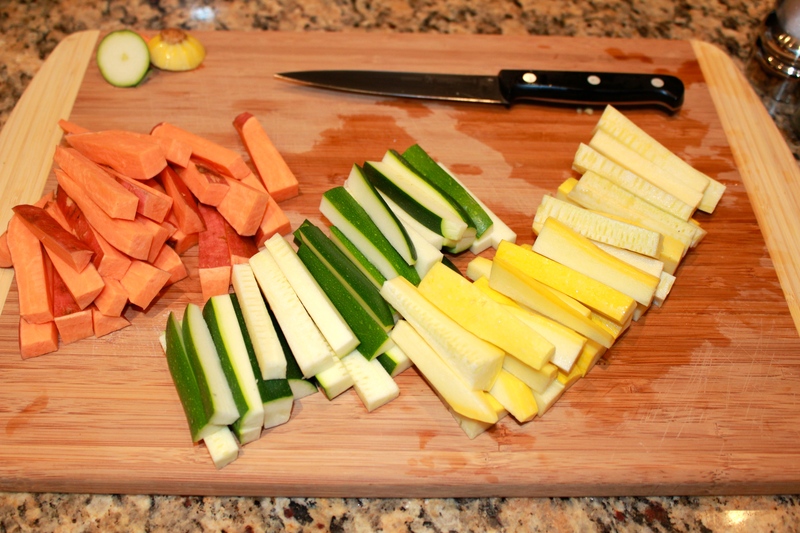 Chop your veggies into fry-shaped matchsticks. 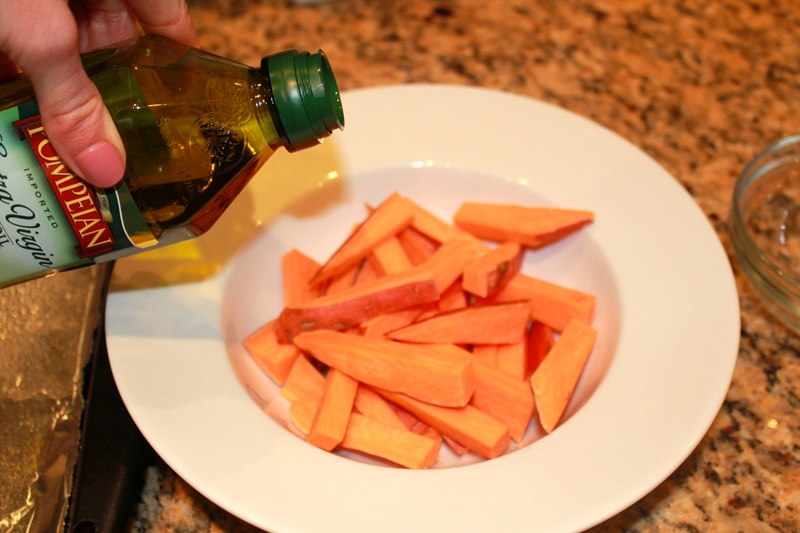 In a large bowl, pour 1 tsp olive oil, 1 tsp cinnamon, and 1/4 tsp salt over your sweet potato sticks. “Stir” with your hands until all the fries are coated. Lay on a baking sheet lined with foil and sprayed with cooking spray or olive oil, and slide into the oven for 10 minutes. Meanwhile, set up your dipping station. Pour egg substitute into one bowl, and mix panko crumbs, almond meal, Italian seasoning, parsley, parmesan, 1/4 tsp salt, and 1/4 tsp pepper in a second bowl. 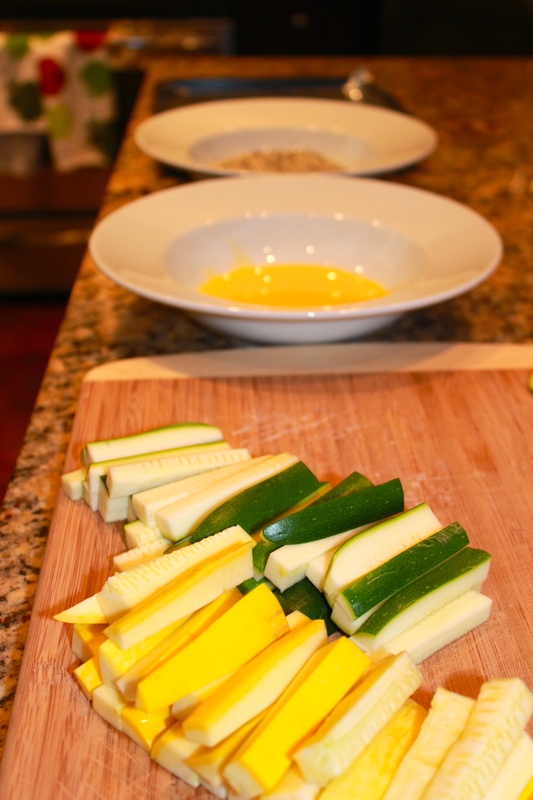 Dip each zucchini and squash matchstick into the egg, then into the breadcrumb mixture to coat. Lay on a second baking sheet lined with foil and sprayed with cooking spray or olive oil, and slide into the oven for 20 additional minutes. Be sure to monitor both the sweet potato fries and the zucchini/ squash fries so they don’t burn … I took my sweet potato fries out a bit before the 30-minute mark. Enjoy with marinara sauce, ketchup, salsa, or just on their own! 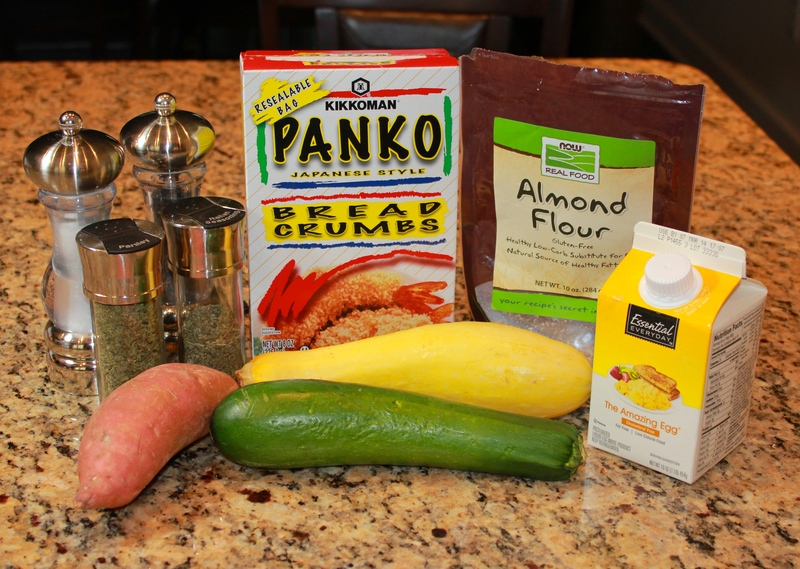 If made according to this recipe, each serving will have 104 calories, 3.5g fat, 15g carbs, and 4g protein. 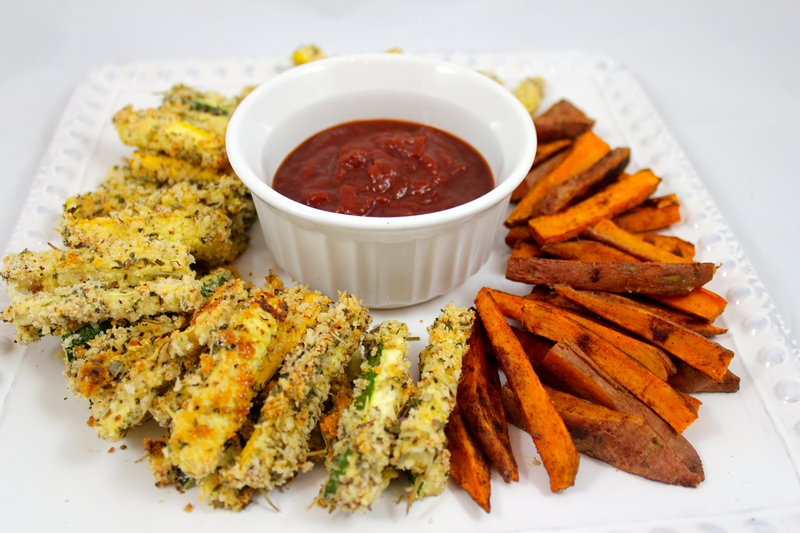 So tell me in the comments … Have you ever made veggie fries? Why did you choose whatever you chose for your favorite part of the Super Bowl? I hope you get some time to enjoy the game, Sara! 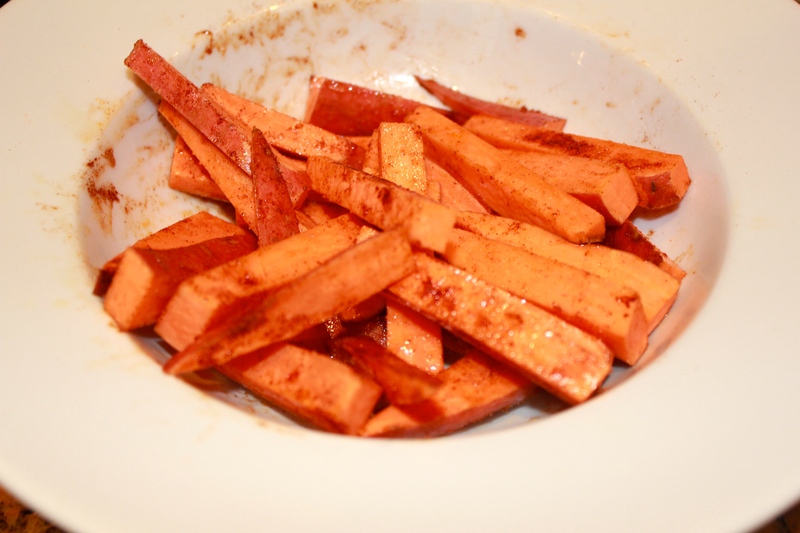 I make sweet potato fries all the time! I really want to try making them with zucchini and squash. Also, your recipe looks much more creative than how I usually make them. It looks easy and I think I already have all the ingredients! I have to admit that my favorite part of the Superbowl is the food:) I do enjoy the game, halftime show, and commercials, but I don’t like that its on so “late” (for me) on a Sunday night. I actually wouldn’t mind if it was moved to Friday or Saturday! Me too, Lisa! I have some form of sweet potato before almost every long run. I hope you try the zucchini and squash versions, too! I’m kind of with you on the timing – if it got moved to Saturday, we’d all be able to enjoy the day more and not worry about how we felt the next day at work! I hope you enjoy them, Patty! Meg: I am pretty sure that the word “bowl” in Super Bowl refers to a football game and not to my bowls of chicken wings, guacamole and potato chips. Thus, I voted for the football game as being my favorite part of The Big Day. If the NFL would call upon me to entertain the masses at half time with my amazing array of card tricks, I am confident that The Halftime Show would challenge The Game as the favorite part of Super Bowl Sunday. Gary, the “powers that be” at the Super Bowl are probably trying to decide between asking you to show your card tricks and asking you to talk about the “history of Thanksgiving” … so that’s why you haven’t gotten the call yet :). You had me nervous there when I saw the fries in your picture. They very much look delectably and scrumptiously deep fried. Nice job! I always forget to look what day the Super Bowl is when I’m putting my shift requests in at work. Invariably I end up scheduling myself to work that Sunday. Thanks, Robert! If you eat them right out of the oven (rather than refrigerating and then microwaving), they do taste fairly fried! Sorry about your scheduling conflicts, but I hope you get to catch at least a bit of the game! Half time show for me! I love veggie fries. I have a really good recipe for flax asparagus fries that I’m kind of obsessed with. Butternut squash fries sound great, Gigi! I’ve tried a similar thing with kabocha and it was great. Thanks for dealing with my overthinking on #MMAZ! All linked up now! 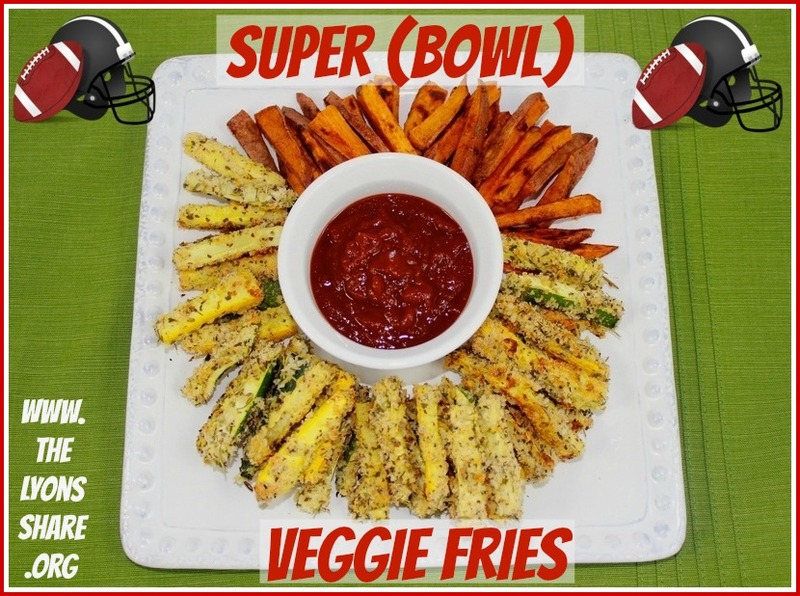 I don’t even watch the super bowl but I want to just so I can make these veggie fries! Not sure if we will watch (since my Pats are out), but will at least have some type of party – which is always the most fun. Making food, the four of us gathering up and hanging out. We rarely get to the end, but it is a great time anyway. And those veggie fries are pretty much what we have at least once a week – it is one of the veggie things that has really resonated with my family (because they taste awesome!). Thanks for the post – have a great weekend! Oops … I suppose it is testament to my ignorance of all things music that I said “If you like music … the half time show is one of the best performances of the year.” Sorry :). Forgive me! Enjoy your party! Haha – no, *I* am the weird one, even growing up with video becoming more and more important and MTV launching when I was in high school … I have always separated them. Haha, you made me laugh about Katy Perry! Yes, I chose the Mavs over the Grammys. Were there any performances that you recommend I try to YouTube? I haven’t even gone back to see the dresses – I’m shocked by my pop culture ignorance today :). I thought that the Kendrick Lamar & Imagine Dragons performance was about as high energy as it got – thought Nine Inch Nails & Queens of the Stone Age were a close second. The Macklemore one was moving as 34(?) couples of all types got married during the song, but the song itself was nothing special. John Legend did wonderful as always, and by singing to his wife gave everyone ‘the feels’. Most everything else was pretty generic musically – Pink did an acrobatic show and clearly didn’t sing. Taylor Swift didn’t sing but did whip her hair back and forth. Having Paul and Ringo play a very Beatle-esque song was good fun, and Robin Thicke with Chicago reminded me of just how much current vocalists rely on the studio to sound better. I love them, too, Angela! Hope you enjoy these! My husband and I throw a party every year, and each year it grows. I love the party because I always love parties!!! 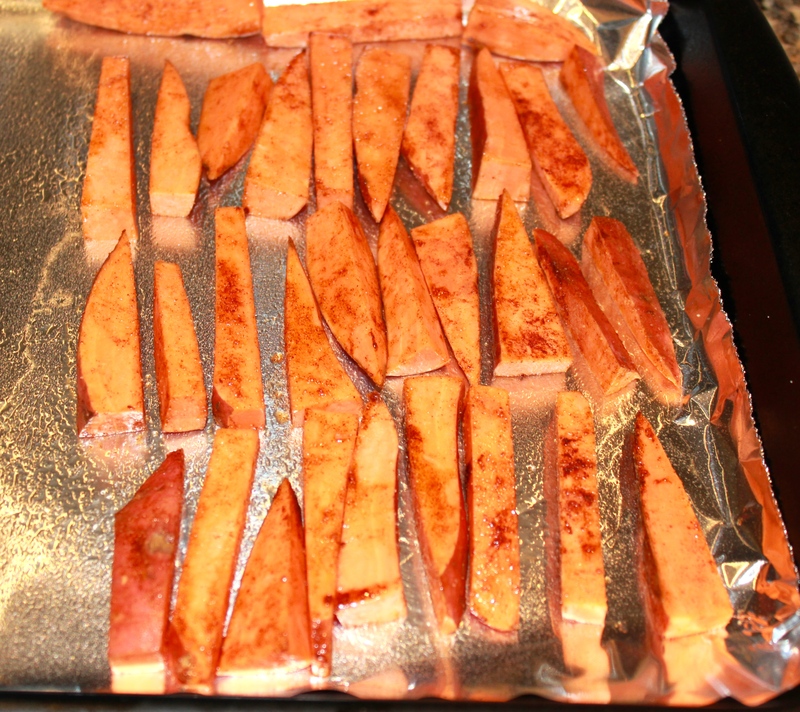 I’ve never made veggie fries before, but I have made sweet potato fries and I love them! 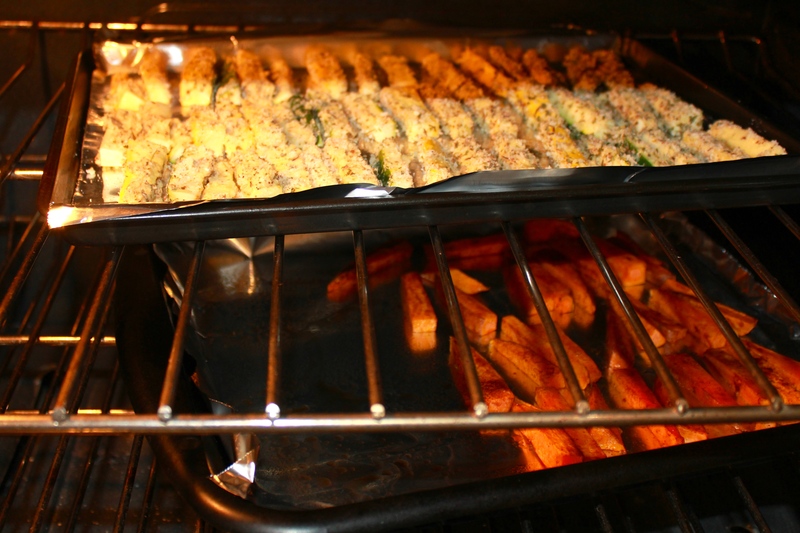 Can’t wait to try the veggie fries, thanks for sharing the recipe. Have a great weekend! I hope your party is great this year, Bre! And you have a great weekend as well! If you don’t like any of those … I don’t know what to tell you. ha ha!! This year will be interesting for me because that’s the day of my 1/2 marathon! I’m either going to be eating a lot, or totally crashing. Either way, a beer will be in my future that day, even after the free one we get at the end. 🙂 mmmm, sweet potato fries I totally pay extra for them when I go out to eat and get a burger. Well worth it. So excited for you to run your half marathon, Tonya! Hope you get to finish strong, shower and take a nap, and then really enjoy your beer(s) and relaxation with the Super Bowl! So all I know about the Superbowl is that Beyonce sang at half time once, Madonna sang at half time once, and Janet Jackson started the nipplegate saga at half time once. However, I will accept your damn statistics AGAIN (which I think deep down I’m starting to enjoy…dammit!) 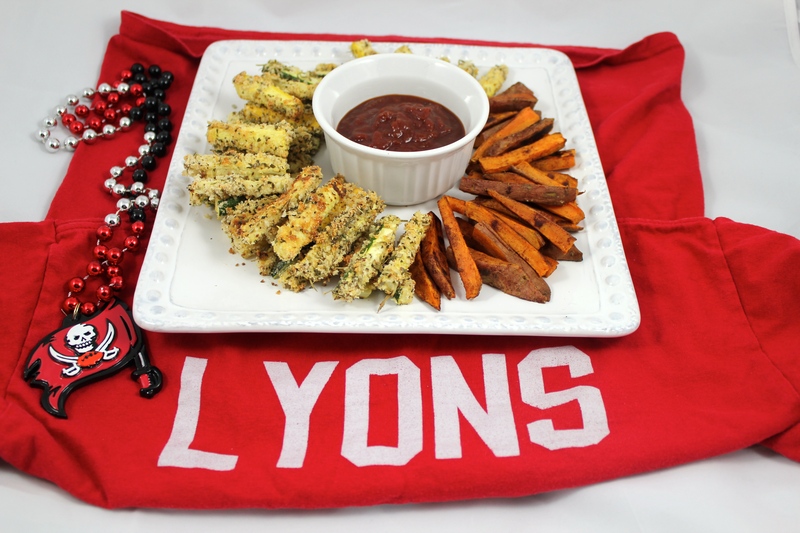 and barrack for your favourite team for those veggie fries….they look amazing! I knew I’d get to you with the statistics, Arman :). And I love your interpretation of the Super Bowl – cracked me up! Most importantly, I’m SO glad you did the “Megan and Kevin” yesterday – those are honestly some of our favorite memories, as Sydney is SO gorgeous and fun to walk around! And stopping in a park to read just felt so luxurious and relaxing! 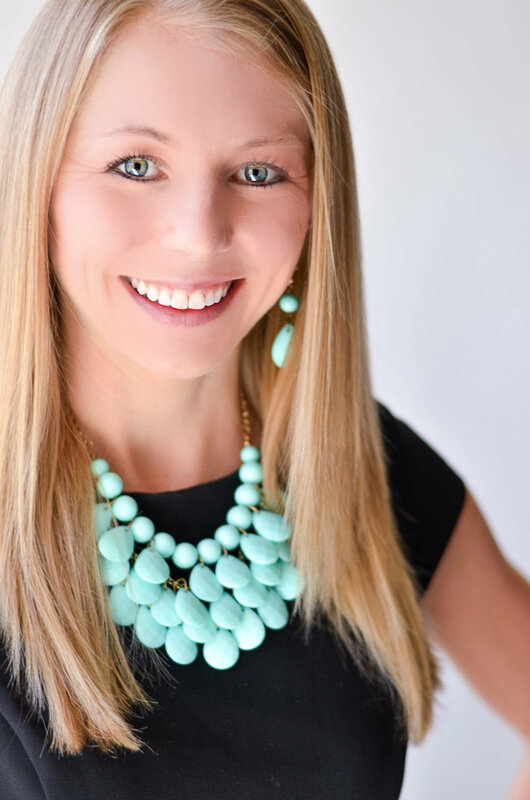 Jill @ Fitness, Health and Happiness recently posted…What Does “Be True To You” Mean To You? I think veggie fries are a perfect way to get picky eater kids to enjoy their veggies … I’m going to have to send this post over to my sister if she hasn’t already read it. Enjoy the Super Bowl! What a great idea!! I do make SPF but never the vegi ones. I do like squash so I;m going to try it! Thank you! I hope you enjoy them, Dr. J!